Political demonstration in Azerbaijan. Photo by Jahangir Yusif, used with permission. Today is the birthday of the friend of the youth, our Mr. President. I sincerely congratulate you on behalf of “Azerbaijani Youth Alliance” public union and myself. I wish you lots of luck in all the work you do for turning our Azerbaijan in the worlds most strongest states! We are proud of you! She was wishing him a happy birthday, on Facebook. The man’s whose birthday she was so candidly celebrating was Ilham Aliyev, the current President of a small country called Azerbaijan. She is a young woman from Baku who works for a government institution. Reading the message was heart wrenching. At the time of its writing, there are people behind bars for doing something not unlike what this user was doing – expressing their opinions. Perhaps this young woman doesn’t know them, but I do. They are not hooligans or terrorists — they represent no threat. They are innocent men who have families and friends waiting for them to get out. According to the Baku-based Human Rights Club, currently there are 142 people “in detention or imprisoned for politically motivated reasons” in Azerbaijan. The comprehensive list includes the names of journalists, bloggers, human rights defenders, activists, religious figures and others. 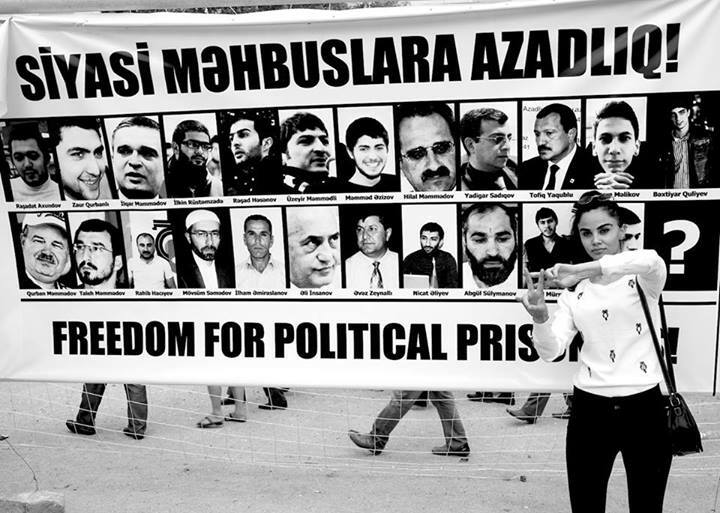 To be more precise, this group includes ten journalists and bloggers; two human rights defenders; eleven youth activists (so much for the caring love and compassion of the president); six political activists; seventy-four religious activists; seventeen people (of various background including police, former employees of the executive authorities, militia, and former prime ministers) serving lifetime prison sentences; and nineteen cases involving other politically motivated charges. On December 18 of this year, Anar Mammadli, chairman of the Election Monitoring and Democracy Studies Center (EMDS) landed behind bars on charges of tax evasion, illegal entrepreneurship (failure to obtain proper institutional permits) and “abuse of office” (Criminal Code Article 308.3), suggesting that he sought to interfere with election results. Mammadli’s arrest was seen as yet another politically motivated move by the government. The EMDS Center is one of the few independent election observation bodies that does transparent work and publishes its findings in Azerbaijan. When the case against EMDS was originally brought in late October, following national elections, the Center’s offices were searched and equipment, reports, news releases and financial documents were confiscated. Last year, Azerbaijan hosted the 7th international Internet Governance Forum — the annual multistakeholder meeting organized by the United Nations to discuss public policy issues related to the Internet. Many government representatives attending the event repeated over and over again that human rights, press freedom and Internet freedom were all doing just fine in Azerbaijan. Ironically, as over 1500 international delegates attended the event, at least eight journalists and three human rights defenders were serving prison terms for criticizing public officials and for writing on sensitive government issues. All were sentenced on dubious charges. The Azerbaijani government is working hard to present a rosy picture of our country abroad. Government supporters — like the young woman wishing Aliyev a happy birthday — have helped this effort. Like anyone else, she used the Internet to express her views on government activities — she’s exercising her right to free speech. But this woman will not find herself in jail. She will get a pat on a shoulder and a golden star for her immaculate behavior. How many more gold stars will be issued and innocent lives ruined before things really change? Arzu Geybullayeva is an Azerbaijani blogger and regional analyst based in Istanbul.